Monday: Husband forgot, turned on the TV right away in the morning. So, our turnoff time did not officially start until 8:00 a.m.
Tuesday: My bad. As part of our outings and errands on Tuesday we visited the library. Without thinking, I agreed to let my daughter check out a video. Of course when we arrived home she wanted to watch it and became a little upset. Since the video was a 1/2 hour VHS version of Ludwig Bemelmans' Madeline I allowed her to watch it once, telling myself that technically it was a picture book in visual form. Wednesday: No TV! Yay! We played with friends most of the day. Thursday: Once again, no TV! Lots of pretend play and block building occurred. Also, with the lovely weather outside we spent some quality time getting a little fresh air. Friday: No TV during the morning and afternoon. Attended a birthday party. No TV there either. Husband broke down and turned it on for 10 minutes in the evening while he was trying to comfort our son who became sick with a cold and fever. That is the story anyway. Saturday: Caught my husband sneaking a peak at a car race. Sunday: With church and visit to Grandpa and Grandma's house, hopefully we will finish out our week in good form!! 4/27 Update: Well, we ended up having to switch on the tube for awhile Sunday evening because of the severe thunderstorms and tornado warnings in our area. I don't think that use should be counted against us. The TV provided the most up-to-date information regarding tornado locations and details even though we also kept an eye on weather websites and listened to a weather radio. In instances such as severe weather updates, watching a TV really does make sense. 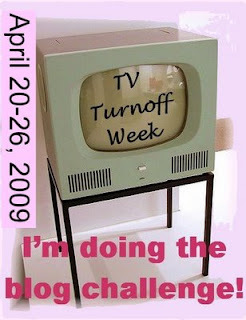 As part of TV Turnoff Week I participated in 3rd Annual Turnoff Week Blog Challenge at Unplug Your Kids. The kids really didn't miss TV at all. Hmmm...maybe we'll have to try harder to keep it turned off all year round. Wow, not so bad! Rationalizations come in handy in my life always! A couple weeks of winners! Next batch of winners! Congrats!